WTF Is An Engaged Glow? Craig Ferguson is playing a little hardball and might leave the Late Late Show. His contract expires soon and apparently Craig would like some more money not only for himself but also for the show itself. Well, yes, the production budget on his show does look kind of small doesn't it? The other issue is that David Letterman was expected to retire at the end of his current contract, but might extend it for another two years to really blow past Johnny Carson's late night hosting record which stood at 30 years. Letterman is at 30.5 right now. I would really miss Craig if he left and if you ever come to Los Angeles, that is the show you need to get tickets for. I used to really like Letterman. He's turned into a cranky, arrogant asswipe. I went to a Craig Ferguson taping last year. That studio is super tiny. Craig is professional AND a perfectionist. It's amazing how much editing they do after the taping, mixing bits from other tapings and changing things around. I hope they give him more money and increase the production values of the show. He's worth it. I'd love Craigy to come back to UK and give people like Graham Norton a run for his money..
give the man some cash to make an even better show! can you imagine what it could be like? There goes my will to live. What is it with CBS and comedians named Craig? Remember his predecessor Craig Kilborn? Oh surfer, I HATED Craig Kilborn! Liked him at first, but then he became more arrogant and seemed to only want to talk about sports. No clue where he is now. Maybe Bai Ling ate him. I don't watch the Late Late Show often, but I caught one show where they answered email questions from the fans. He and Jason Segal were hilarious. CBS does not even promote The Late Late Show. His competitors have huge production budgets compared to his. I have no idea what he is paid, but I am sure it is much less than his competitors. CBS is making money on the show. Who do I watch? Craig Ferguson of course! I like him silly; I like him serious. If he goes, I will give up watching late night television. Easy to do without Craig. I love Craig and will be SO sad if he leaves. I've had the biggest crush on him for the last several years (though he's at least 20 years older than me). If he leaves, late night just won't be the same. Also, saw Craig do stand-up in Vegas one time. He killed it - I was in the front row laughing so hard I was crying. Not sure if he got a kick out of that or not, but he spent most of the night performing directly in front of us. Loved it and HIGHLY recommend seeing him (if I get a chance to see him again, I'll buy tickets in a heartbeat). As an aside, saw Conan's tour the next year. Absolutely no comparison - Craig was WAY better. Hopefully CBS gives him more money (for both him & the show - he's definitely worth it). NOOOOOOOOOOOOOO!!! What can we do? who can we write? Who can we send stuffed bunnies, singing alligators and dancing secratariat to so that this doesn't happen? I don't understand why Craig doesn't get more attention. I DVR his show just for his monologues. And he is hysterical. I hope they give him his due. 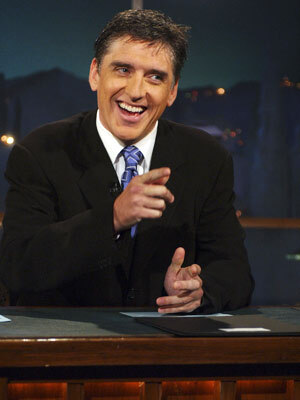 I love craigyferg! His upbeat "It's a great day for America everybody"
The puppets, his choice of harmonica, glittery balls or awkward silence. His show looks like the poor step child of really poor people. It would be a huge mistake to lose this man and his funny take on life. I'll be sad if he goes. His Betty White skits (credit also to his writers) are amazing. Unanimous. I love Craigie F best of anyone. I also love Dave, but in a different, cranky way. Also Jimmy Fallon. Also Jimmy Kimmel. Do we all realize that this is like a renaissance time for late night talk shows? Ferguson is the best and yet CBS treats him like the pet rock of a stepson twice removed. They don't even have decent lighting in the studio and the roof leaks. He is worth the money, CBS; pay up! Damm, I just LOVE Craig. I'm usually bored watching Letterman since he has turned into a cracky old coot. Ferguson is soo damm funny. I even love it when they censor him...he makes that funny too. CBS you will be such a douche if you kill his show. CBS - Pay this man!!!! I love him! Craig Ferguson is my FAVORITE late night host. I'd hate it if he left. I usually think stars are just being divas when they want more money, but in Craig's case, I agree. He takes an indie-level budget and makes it into a blockbuster show. I can imagine how great it would be if he got Kimmel's budget. But...but....I have a dream to go see him & dance with Secretariat!! He can't leave!! His show is so good and as much as I love Fallon and my beloved Conan, I appreciate Craig's monologues which never fail to make me laugh. LOVE Craig Ferguson! I say we start a petition and send it to CBS. I watch his stand up on Netflix and it is soooo funny! He out does them all. Wish he was on earlier. I wish he was on earlier. I love him.CBS needs to SHOW HIM THE MONEY.